Customers crave sales, but they also crave stories. How you frame your commodity, brand, and business is just as important as its price points. But, no matter how compelling, is there such a thing as too much content? Content is king, and today there are myriad channels on which you can share your company’s story and enrich its narrative. Customers can sense when they’re being baited; instead of pulling them, engage with them. But when it comes to content, there’s an enormous difference between quantity and quality — the secret is how the messaging is packaged. 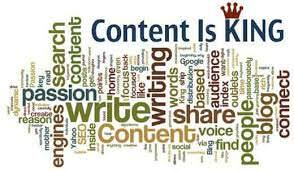 Below are some tips to keep your content voluminous but fresh and wide-reaching but diverse. Space your content out so your readers and customers don’t get bored but also don’t forget your messaging. Determine how you deploy reminders, nudges, and last call notifications. And evaluate as you go! If you need to build more interest, revamp your efforts or factor in an extra sale. If your engagement is racking in the likes, hearts, and retweets in the first several days of your campaign but you notice a letdown in the ensuing efforts, it’s okay to pause. Your customers would prefer you restrategize than pummel them with content. Find a new way in, experiment, and proceed from there. Facebook and Twitter and blogs, oh my! There are a myriad ways to connect with audiences near and far; the important thing is to use your mediums appropriately. Have a pithy idea or a snappy comment? Gravitate toward Twitter. Do you have a golden photo of your product or event? Post it on Instagram and Facebook. Just as crucial is knowing your audience: Instagram and Snapchat’s users skew younger, Facebook’s a little older. If you have solid open rates in your blasts, stick with that technique and build on it. Big announcements can be unleashed on all your channels at once, but for smaller news, space out updates on various platforms to keep your followers engaged. “Focus on your ideal client,” as Forbes advises. Don’t waste your time spewing content for content’s sake. Ask yourself a few key questions before acting: Who is this story, video, or essay meant for? What are your customers’ needs? Are you trying to appeal to their emotions or logic or finances? Content without direction is just noise; be a savvy practitioner and craft stories and content you would want to see so that your followers see and read the best and most alluring version of your brand. Have a killer blog post? Excellent, but just because your post is word-heavy doesn’t mean it only needs to exist on your website or in an e-blast. Tease it out in different ways across varying channels. The benefits are twofold: you will look like you have more content when you are instead recycling it, and you are approaching your customers from different angles to rack up unique impressions. If the blog post drops on Facebook on Monday, consider emailing it on Tuesday, and the putting it on Twitter for Wednesday. How? Whet your followers’ appetite with by tweeting a snippet or pull quote from the essay before linking them to the rest of it. Then on Thursday, chop your post up into bite-sized morsels that you can share in an Instagram story. Let your followers interact with your content in new ways across platforms, giving different users fresh experiences. After reviewing these tips, is there actually a thing as too much content? The quick conclusion: No, if you wisely space it out. People want to see the inner workings of your business. They want to see the faces behind it. They crave your stories, you need only come up with bright ideas to share and versatile ways to present them. Your company already has singular tales and offerings, now you simply need to share them generously and diversely. This entry was posted in Blog and tagged channels need content, content, content calendar, Content marketing, content strategy, story telling. Bookmark the permalink. « People — Not Just Companies — Need Brands: What’s Yours?